The new vessel is expected to be commissioned in 2019. China kicked off construction of its first domestically-built icebreaking research vessel in Shanghai on December 20, according to local media reports. The construction will be carried out by Jiangnan shipyards, located on Changxing Island in Shanghai, which has also been building Type 052D Luyang III-class destroyers for the People’s Liberation Army Navy (PLAN), among other ships. 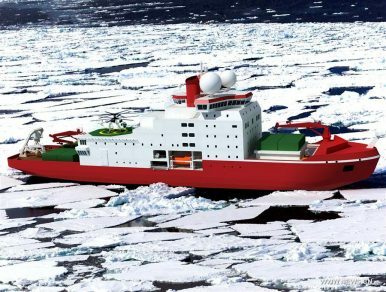 The new polar icebreaker will not operate under the PLAN but as a civilian vessel under the Polar Research Institute of China (PRIC). The PRIC is attached to the Chinese Arctic and Antarctic Administration a subdivision of the State Oceanic Administration, which is an administrative agency reporting to the Ministry of Land and Resources. The new icebreaker is expected to be completed by 2019. According to the head of the PRIC, Yang Huigen, the ship will displace 13,990 tons and will be 122.5 meters long and 22.3 meters wide. It will be capable of breaking through ice up to 1.5 meters thick at a top speed of 3 knots on both its bow and stern. The icebreaker will have an operational range of around 20,000 nautical miles and will accommodate a crew of 90. “Equipped with internationally advanced marine survey and observation devices, the new vessel will be an important platform for the nation to conduct polar research on marine environments and resources,” CCTV reports, citing PRIC. The new ship is expected to team up with the larger 15,300-ton Ukraine-built icebreaker Xuelong, currently the only icebreaking research ship in service with the PRIC. In December 2015, the PLAN commissioned the lead vessel of a new class of icebreakers, the Type 272 Hai Bing 722, into its Northern Fleet. In March 2016, the PLAN commissioned its sister ship, the Hai Bing 723. Both military icebreakers serving in the Northern Fleet are tasked with patrolling the Bohai Sea and keeping the ports, including the nuclear submarine shipyard at Huludao, free from ice. China is hardly an arctic power. For example it only is a permanent observer in the Arctic Council and while it has an Arctic policy, it has not announced an Arctic strategy. China’s presence in the Arctic is nevertheless expanding along with its economic interests. As I reported elsewhere (See: “Russia and China in the Arctic: Is the US Facing an Icebreaker Gap?”), China first showed a military presence in the Arctic in September when five PLAN warships were spotted in the Bering Sea, off the Aleutian Islands, where they reportedly entered U.S. territorial waters. It is fair to assess that China’s interest in the fast-thawing Arctic Ocean is bound to increase in the future. The Xuelong 2 launched on September 10 and is expected to be deployed next year.